The E26 stacklight unit is a modular system that provides illuminated and audible status indication in all directions. Easily assembled plug-in modular units include constant and flashing light units, as well as bi-tonal alarm systems. Stacklights may be assembled in a variety of configurations. Numerous lamp, color and mounting options further enhance the stacklight’s versatility. 1) Select a Base Unit: Two base units are available, the standard base unit or a flashing base. 2) Select an Extension Tube: Models are available in lengths from 1 inch to 14 inches as well as with angle design. 3) Select an Optional Mounting: The standard 4 hole mounting plate attaches to the bottom of the extension tube to provide a secure means of mounting the stack light. 4) Select up to Six Light Modules: Light modules are available in a variety of colors with either incandescent or LED light sources. The incandescent lights are lower cost and brighter the LEDs, however, the LEDs have a longer life. 5) Optional Alarm Module: The bi-tonal alarm module mounts on the top of the stack. Up to 5 light modules may be used with the alarm module. For use with incandescent or standard LED for steady, non-flashing illumination or with flashing LEDs for flashing illumination. Bases include terminal block for wiring, stacklight cover and gasket. 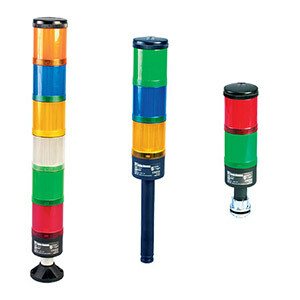 Allows configuration of each light in the stack for either steady or 60 times per minute flashing illumination. Flashing circuit for use with incandescent lamps only. Available in a variety of colors for both incandescent lamps and LED lamps. To maximize illumination and light dispersion, incandescent units include an opal white diffuser while LED diffusers are clear. May be fitted to the top of a complete stacklight unit or directly to the stacklight base, if desired. Also features adjustable sound levels. Flashing base 120 Vac/dc - for incandescent lamps only.